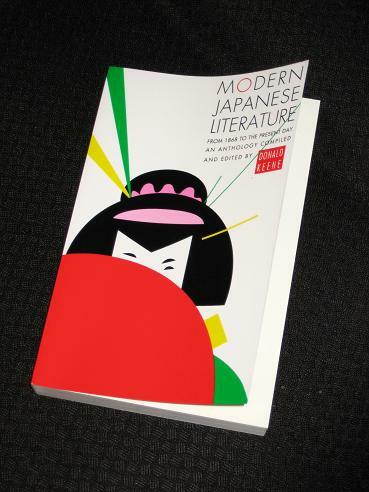 Modern Japanese Literature, an anthology edited by Donald Keene, is a collection of Japanese writing covering the period from 1868 (the start of the Meiji Era, traditionally considered the beginning of ‘modern’ Japan) to the middle of the twentieth century. Unlike the Oxford collection, Keene’s book is not restricted to short stories – it also contains traditional and Western poetry, a couple of plays and extracts from classic novels. Running to 438 pages, there’s enough here to give any beginner a fair overview of the must-read writers of the period covered. It would be impossible to cover all the works in detail, but I thought I would briefly touch on some of the ones I liked most from the various genres (concentrating on things I hadn’t read before). In terms of extracts from novels, Shimei Futabatei’s The Drifting Cloud, an incomplete work from the late-nineteenth century, is one that appealed, with its story of a bumbling civil servant trying to find love in Meiji Japan. I’m also tempted to splash out on Jun’ichiro Tanazaki’s novella Captain Shigemoto’s Mother and Yukio Mishima’s semi-autobiographical work Confessions of a Mask on the strength of the extracts given here. There were several short stories I liked, and I wish there had been many more of them. Among the best were Ichiyo Higuchi’s Growing Up and Kafu Nagai’s The River Sumida, both of which are lengthy, historical, coming-of-age stories set in and around the red-light districts of Tokyo. Another favourite was Riichi Yokomitsu’s story Time, a beautifully-written tale of a troupe of actors on a dangerous night journey through the mountains (running away from an unpaid hotel bill…). Finally, I also enjoyed Osamu Dazai’s story Villon’s Wife, another of his tales of mistreated women and badly-behaved men in post-war Tokyo, similar in style to his novel The Setting Sun. Despite its good points though, I wasn’t entirely happy with the anthology. One issue I had, the abundance of novel extracts, was my own fault as I really should know what the word ‘anthology’ means… However, there were some other problems as well. For one thing, the label ‘modern’ is a complete misnomer as the collection was released in 1956. Anyone looking for Murakami, Yoshimoto, Ogawa or Abe will be sadly disappointed, and Mishima and Dazai are included as examples of the young generation! A final issue I had with the collection though was a feeling that the translations weren’t always up to scratch. This is a contentious issue, and many people are loath to believe that you can judge translations, but I actually had a few texts to compare. In my private library (! ), I have other versions of three of the works included here: Ryunosuke Akutugawa’s classic story Hell Screen; Natsume Soseki’s Botchan, a staple of the Japanese school curriculum; and Ogai Mori’s The Wild Geese, one of the most famous of the early Japanese novels. Modern Japanese Literature is far from perfect, and compared to The Oxford Book of Short Stories it doesn’t come off too well. However, it’s still worth a try; there is a lot of good writing in there, much of which I wasn’t aware of before opening the book. Still, if you have the choice, I’d go with the Oxford book as a first collection of classic J-Lit. It’s a lot more consistent and, more importantly, more consistently rewarding. You are so right – the title and content is a little bit misleading, a little bit out of date, and there are glaring ommissions. However, for so many students of Japanese, it is still their first introduction to the literature of the country, and gets them reading more widely and more deeply. So credit for that. Also, the Columbia anthology has got its problems too… (although it is a bit more modern). this is in my wishlist, but already have the Oxford, so may revise may choice, although might introduce me to some poetry not yet read. That Columbia Anthology is very expensive. If that was the only problem but it seems not. Unfortunatyle a few of the points you mention about the anthology you read (excepts of novesl, the translations, patronizing tone and what not) are not tempting. . I like confession of a mask, I thought it was good. Anything from Yukio Mishima is good for me. The only Japanese short stories I read are Murakami's.